French Creole architecture is one of the nation's three major colonial architectural traditions. It takes its place alongside British Colonial, as exemplified by the saltbox houses of New England and a later generation of Georgian houses, and Spanish Colonial, as seen in the missions of California and the Southwest. The French Creole building tradition appeared in New France, i.e., in the United States, the Mississippi Valley. Because the region was sparsely settled at the time, very little French Creole architecture was built outside Louisiana. And today Louisiana is home to the overwhelming majority of surviving examples. 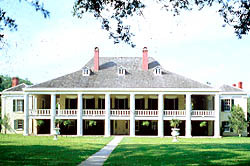 There is much scholarly dispute as to the origins of the French Creole building tradition. Some have noted distinct similarities to buildings in France while others emphasize the evolution the tradition underwent in the New World, principally the Caribbean. Regardless of its origin, it is a distinctive building tradition characteristic of French America. French Creole architecture, of course, began in the French colonial period (1699-1762). However, the tradition continued in popularity well into the 1800s. 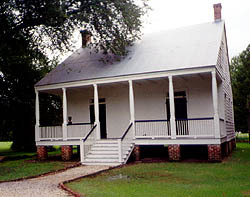 By the 1830s and 40s, one sees houses that combine French Creole features (see below) and Anglo-American traditions such as symmetry and a central hall plan. The typical rural French Creole house can be described as follows. Its most important features include: 1) generous galleries, 2) a broad spreading roofline, 3) gallery roofs supported by light wooden colonnettes, 4) placement of the principal rooms well above grade (sometimes a full story), 5) a form of construction utilizing a heavy timber frame combined with an infill made of brick (briquette entre poteaux) or a mixture of mud, moss and animal hair called bousillage, 6) multiple French doors, and 7) French wraparound mantels. The previously mentioned timber frame incorporated French joinery i.e., angle braces that are extremely steep, running all the way from sill to plate, in contrast to English joinery where the angle brace is almost a 45 degree angle. Urban examples shared most of these characteristics but often lacked commodious galleries. Indeed, the quintessential Creole cottage in New Orleans stands flush with the front property line and has no gallery. Also, urban areas had what is known as a Creole townhouse, a multi-story, typically L-shaped building standing flush with the sidewalk. The first floor served as mercantile space and the upper floors as the family's living quarters. Some Creole townhouses had a low mezzanine-type storage area known as an entresol located between the first and second floor. A wide carriage passage connected the street to a rear courtyard. Today surviving Creole townhouses can be seen mainly in New Orleans' French Quarter. Creole floorplans are distinctive in the following respects. They tend to be asymmetrical and always lack interior hallways. Openings are placed solely for the convenience of the interior, and without any regard for a pleasing architectural effect on the exterior (i.e., producing an irregular schedule of openings). Often the rear range of rooms consists of an open loggia with a small room at each end known as a cabinet. The rural French Creole building tradition is also known for the use of pigeonniers to ornament the plantation. Domestic pigeons had value not only as a delicacy but as a source of fertilizer. However, as noted by Louisiana plantation specialist Barbara Bacot, it was less a taste for squab than for status that exalted the pigeonnier. Bacot, in Louisiana Buildings, 1720-1940, notes that in France only landowners had the right to keep pigeons under the Old Regime, and some of the landed gentry chose to frame their houses with pairs of dovecotes. 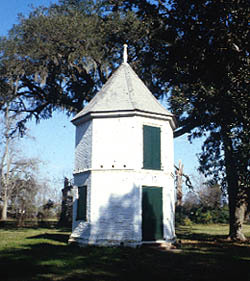 In Louisiana, pigeonniers used in the form of monumental towers set near the main house continued as a fashion well into the 19th century. By contrast, on English plantations, where birds were sometimes kept, the roost or dovecote would typically have been little more than nesting boxes set in the gable of the barn.